It provides automated translation to and from the major European languages. 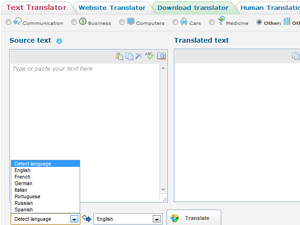 PROMT Online-Translator provides automated translation to and from the major European languages. Works with English, French, German, Italian, Portuguese, Russian and Spanish languages. To improve the quality of translation you can select the profile of the text to be translated. There are also virtual keyboard, spell-checking, dictionary references, possibilities of sending translation by e-mail and printing. The mobile version is available to owners of mobile devices. Remarquable traducteur et fidèle. Vraiment il me rend de grands services. Merci. A faire connaître, ce que je fais ! Замечательная программа,Я нею очень доволен и постоянно только ней и пользуюсь.Огромное Спасибо!!!! A free web-based version of Microsoft's Office productivity suite. Convert PDF to JPG fast and easy. There is no useless and boring registration. A web-based word processor, spreadsheet, presentation, form, and data storage service offered by Google. An advanced web-based optical character recognition (OCR) application.